Evaluating the safety, efficacy, and cost of various treatments was a large part of my training as a pharmacist. I have put my training to use in overcoming Hashimoto’s, and have found that a combination of the right medications (when indicated), the right lifestyle changes, and the right supplements, can have a tremendous impact on recovering from Hashimoto’s. Using the right supplements to address underlying nutrient depletions​ is a great way to speed up the healing process. One such supplement that I consider crucial to thyroid health is readily available in the food supply, but can be deficient in those with autoimmune disorders. That supplement is vitamin E.
Most people who are diagnosed with Hashimoto’s will present with low levels of vitamin E, as well as low levels of selenium, vitamin A, the B vitamins, potassium, iodine, glutathione, zinc, and ferritin (the iron storage protein). Many of these nutrients are essential for proper thyroid function, in addition to optimal immune system, gut, liver and adrenal function. Why do people with Hashimoto’s have so many nutrient depletions? Conventional farming methods and food processing are robbing our food supply of good nutrients. In conventional farming methods, the same vegetables are grown on the same soil the year after, depleting the soil of nutrients. Vegetables are also harvested before they are ripe and have had a chance to pull all of the nutrients from the soil they were planted in. These conventionally grown vegetables are far less nutritious than organic varieties. A deficiency in digestive enzymes will prevent the proper extraction of nutrients from foods. Altered gut flora, or dysbiosis, will also prevent the extraction of nutrients from food. Some of the most common medications prescribed to people with Hashimoto’s are notorious for depleting the body of nutrients. These include acid blockers, antibiotics, and synthetic estrogens and progesterones (such as the birth control pill). Many of the diets that people with hypothyroidism follow to help relieve their symptoms can actually be a root cause for nutrient depletions, as some essential vitamins may be eliminated from their diets. Likewise, vegan, vegetarian and low-fat diets can put us at risk for deficiencies, including deficiencies in vitamin A, vitamin B3, vitamin B9, vitamin B12, vitamin D, calcium, chromium, copper, iodine, iron, magnesium, manganese, zinc and omega-3s. Additionally, hypothyroidism in itself can lead to poor extraction of minerals and vitamins from our food sources. Thyroid hormones determine our metabolism throughout the entire body, including the digestive tract. A lack of sufficient thyroid hormones makes nutrient extraction more difficult and less efficient, and can ultimately lead to nutrient deficiencies. 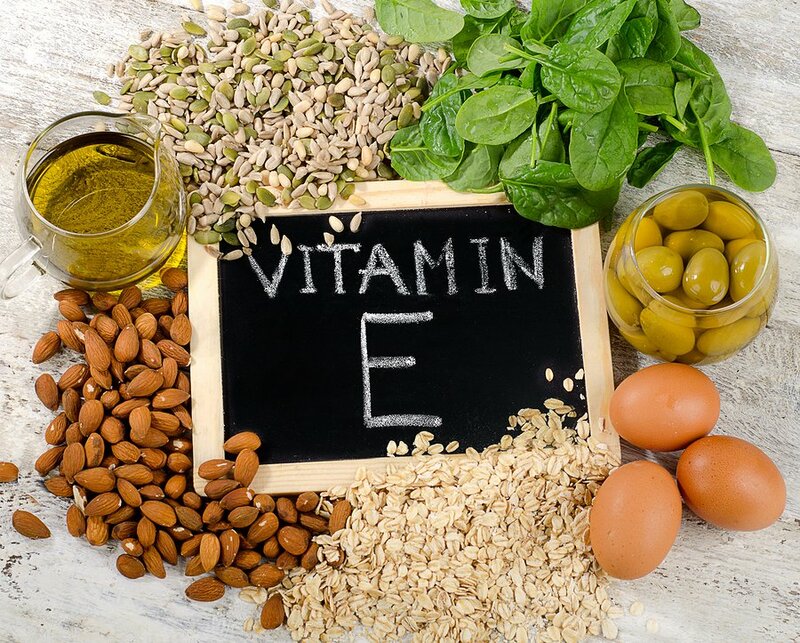 Vitamin E is a fat-soluble vitamin that is naturally occurring in many foods, including vegetable oils, cereal grains, animal fats, meat, poultry, eggs, fruits, and vegetables. Wheat germ oil is a particularly rich source of vitamin E (though I definitely don’t recommend it for people with Hashimoto’s). Topically, vitamin E is used for treating dermatitis (eczema), sunburns, scarring, aging skin, lice, and stretch marks. It can also help protect against skin ulceration caused by the use of chemotherapy drugs. The uses for vitamin E are vast, and its importance to human health has been well established. While a deficiency is rare for most populations, it is most common in people with malabsorption disorders. Since malabsorption due to intestinal permeability (a factor that must be present in order for an autoimmune condition to occur) is so common in people with Hashimoto’s, supplementing with vitamin E can be a crucial step to restoring your health and feeling better! Antioxidants, including vitamin E, vitamin C, beta carotene (vitamin A precursor), and the minerals selenium and manganese, act as free radical scavengers. These free radical scavengers protect our bodies from the damage caused by reactive oxygen species, which are created by oxidation reactions and can damage our cells. For example, iodine from foods and supplements is processed by the thyroid gland so that the body can properly use it. During this process, hydrogen peroxide, a free radical, is released. In cases where the body has adequate levels of selenium and it is used properly, the selenium neutralizes the hydrogen peroxide. However, in cases of iodine excess, excess hydrogen peroxide that is produced can cause oxidative damage to the thyroid gland. A lack of antioxidants may result in thyroid damage from hydrogen peroxide every time iodine is processed by the thyroid. Vitamin E, selenium, and iodine all work together, and it is essential to have these antioxidants in the right amounts. Selenium plays a crucial role in thyroid function by acting as a catalyst to convert the inactive T4 to the biologically active T3, and protecting thyroid cells from oxidative damage. Studies suggest that supplemental selenium could alleviate the toxic effect of excessive iodine intake on the thyroid. Selenium is a trace mineral incorporated into proteins to make antioxidants like glutathione peroxidase. Known as a selenoprotein, this type of protein prevents damage from hydrogen peroxide (generated from the conversion of iodide to iodine), by breaking down the hydrogen peroxide into water particles. This allows for the removal of the cells affected by oxidative damage, leads to the preservation of tissue integrity, and prevents the convergence of white blood cells. Interestingly, excessive oxidative stress has been suggested to be one of the underlying mechanisms in the development of thyroid cytotoxicity (the destruction of thyroid cells). Fortunately, the damage can be reversed with not only selenium supplementation, but vitamin E supplementation as well. In fact, one study on rats showed that supplementing with vitamin E itself could reverse the effects of iodine-induced thyroid cytotoxicity. Thyroid hormones are associated with the oxidative and antioxidative status of the body, and one study that investigated the oxidant and antioxidant effects on rats found that hypothyroidism is accompanied by increased oxidative stress, but vitamin E supplementation exerts beneficial effects on this situation. Another recent study that was conducted to explore the underlying mechanism and treatment of myocardial injury (injury to the heart) caused by hypothyroidism, evaluated oxidative stress in serum and myocardial tissue of hypothyroid rats. The researchers examined the effects of levothyroxine (T4) replacement therapy and vitamin E supplementation on oxidative stress-induced injury and cell death of myocardial tissue. The exciting results of this study showed that levothyroxine replacement therapy and vitamin E supplementation appeared to improve myocardial health in hypothyroid rats, which appears to be related to improved thyroid function and reduced oxidative stress. The Recommended Daily Allowance (RDA) for foods was established to guide the public on how much of each nutrient is needed to prevent overt disease. These numbers, however, were determined decades ago, without the benefit of current research, and without an adequate understanding of how nutrition affects our physiology. These guidelines have somehow become our “ideals” for nutrient intake, yet the RDA for most antioxidants is too low to see the benefits. For example, vitamin C becomes an antioxidant at doses above 600 mg, while the RDA is only 60 mg — one tenth of that. While 60 mg will prevent scurvy, it will not prevent free radical damage. The same can be said about vitamin E and selenium. Vitamin E is an antioxidant at a dose of 268 mg (RDA is 15 mg), and selenium should be taken at a dose of 200-400 mcg (RDA is 70 mcg) to get the full benefits, for those with Hashimoto’s. To get adequate amounts of vitamin E, taking a supplement may be helpful. Should You Test Your Vitamin E Levels? Vitamin E is a fat soluble vitamin, and in theory, it can build up in the body. However, there are no reliable tests that provide accurate results of vitamin E levels. As such, I recommend sticking to a daily dosage of 268 mg to make sure you are receiving the antioxidant benefits of vitamin E, if you have Hashimoto’s. If you have surgery, please note that vitamin E is one of the supplements you will need to stop prior to surgery, as it may prolong bleeding time. Easy bruising or bleeding is a sign that you may be taking too much. Which Vitamin E Supplement is Right For Me? Vitamin E and selenium work in synergy and are more effective when taken together, so I recommend taking them together on an empty stomach to ensure proper absorption. The problem with so many of the vitamin E supplements on the market, however, is that they contain soy lecithin. So can be very problematic for people with Hashimoto’s who are often intolerant to soy, the same way that they are to gluten and dairy. Soy can also inhibit the conversion of T4 to T3. Furthermore, it is considered a goitrogenic food that will block the uptake of iodine into the thyroid and reduce thyroid output (by blocking TPO enzyme activity). Because I know how important vitamin E intake is for people with Hashimoto’s, I wanted to create a soy free supplement, so I developed Rootcology’s Vitamin E, which is free of soy and any other additives that could have adverse effects on the thyroid. This full-spectrum vitamin E supplement includes all eight naturally occurring tocopherol and tocotrienol isomers that are found in nature, and is in a base of MCT oil (medium chain triglycerides), for enhanced bioavailability. Interestingly, studies have shown that supplementation with gamma-tocopherol increases both gamma and alpha tocopherol levels in serum. The higher the gamma:alpha ratio, the more the alpha-tocopherol concentration is increased. 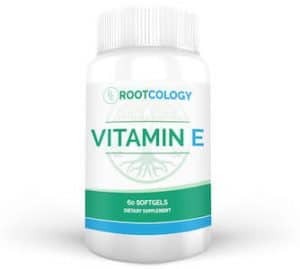 Rootcology’s Vitamin E provides 470 mg of mixed tocopherols and tocotrienols, for antioxidant support — that’s more than 30 times the RDA amount of alpha-tocopherol! There are so many supplements out there, and navigating all the information regarding which ones may be beneficial to you and your situation can be overwhelming at times. I hope this information gives you further insight on your journey toward feeling better. Vitamin E can be a crucial piece of the puzzle as you put together a nutrition and supplement strategy to address your own nutrient deficiencies.